This is a low-dollar ($25) and family oriented event. 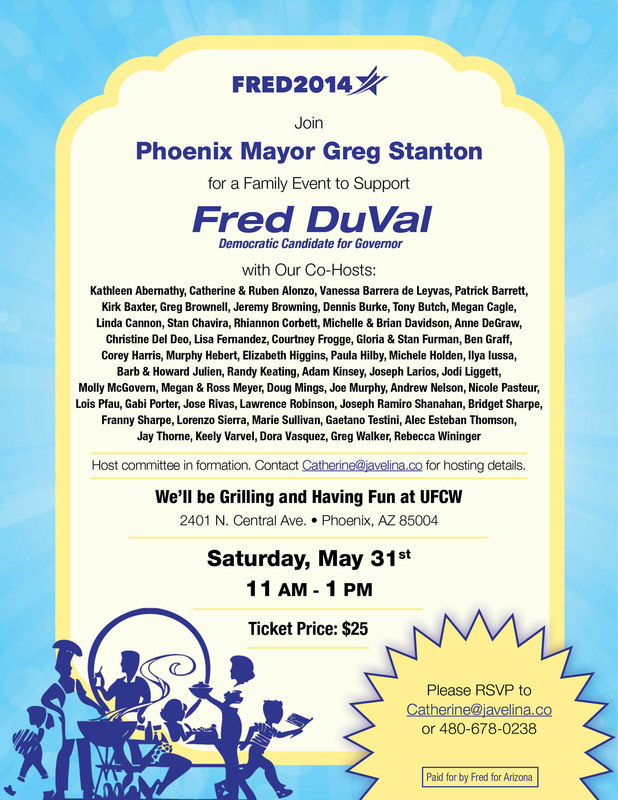 Come cook out with Arizona's next governor, Fred DuVal. Phoenix Mayor Greg Stanton is the special guest, along with an impressive number of co-hosts (including multiple D26'ers.) It will be a lot of fun, and a great way to spend a Saturday afternoon. Please join us this Saturday at 11am! Note on parking - we expect it to fill up fairly quickly, so we advise that where possible, people car pool or utilize light rail. UFCW is a short walk from the Encanto/Central Ave stop. You can also park at the Arizona Democratic Party HQ at Central and Thomas and walk down to the event - it's not fair. Please RSVP below so the DuVal campaign knows how much food they will need.